Special Box is no different from other identical browser add-ons that SuperWeb LLC has been releasing for a while. We recommend removing Special Box because we identify it as an adware application, which does nothing to improve your computer-related activities. On the contrary, the advertising content it starts flooding your browser with has a potential to be not only annoying, but also dangerous. The official site of Special Box, specialboxsite.com, shares the same layout as Air Globe, Useful Program, Web United, and other applications belonging to the SuperWeb family. Also, it lacks not only active links to download the application from, but also any kind of information related to the functionality or developer of this application. You should keep any suspicious applications away from your system, and, if Special Box is already there, remove it immediately. Special Box does not need to rely on direct distribution via the official site to reach target computers; that is, it can spread without any difficulty in software packages. It might be installers or downloaders that upload this application along with the main software onto your system without your even noticing it. In order to reveal all the additional content that might be installed, you are advised to opt for the customizable/advanced installation. There is also a possibility that you might end up installing more than one dangerous application on your machine. Be suspicious of the software you find on unreliable sites and give preference to trusted channels of software distribution; if not, you might need to remove dangerous programs from your machine as soon as possible. It is not hard to notice when Special Box enters your computer: Your Internet browser will start showing advertising content. It might show ads tagged with “Ads by Special Box” or “Provided by Special Box” or other similar phrases. If you are not a fan of advertising and are likely to skip commercials on TV, you probably will not miss this application after removing it from your computer. Special Box aims to redirect you to these promoted sites; however, clicking the endorsed links might not always be safe, as they might transfer you to sites where Trojans or ransomware or other threats lurk. Special Box also collects marketing and advertising-type data about you, generally non-personally identifiable information (browsing history, online paths, search queries, technical specifications, etc.). Though by installing Special Box you implicitly consent to this type of data collection, more skilled computer users would agree that this application is too unreliable to allow it to continue with this activity. Just so you can feel secure that any data related to you will not be a target of criminal activities, we advise that you remove Special Box. Special Box is really a useless application that will do nothing besides showing ads on your browser. It has been noticed that Google Chrome blocks Special Box – another sign that this application is unsafe. If you use Internet Explorer and Mozilla Firefox, however, you will need to delete the application from the program list in Control Panel. Follow our removal guide below, which will make sure you do not have any trouble terminating this adware application. However, a reliable automatic antimalware tool is always advised as a more trusted substitute for the manual removal. Move the mouse cursor to the bottom right corner of the screen to open the Charm bar. Under View by, switch to Category. Select Special Box in the program list and click Change/Uninstall. Under View by, choose Category. Select the unwanted application you want to remove and click Change/Uninstall. 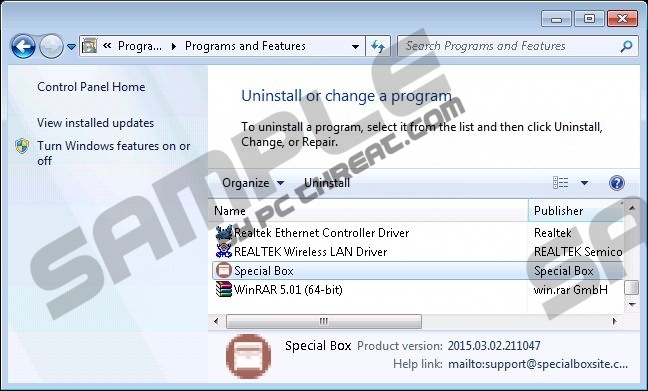 Go to Add or Remove Programs and click on Special Box in the program list. Quick & tested solution for Special Box removal.